Soon after a mid-life refresh, Ford has re-introduced the 1.0-litre EcoBoost petrol engine in the EcoSport. The last time we saw it was in 2013 and since then, not much has changed as far as numbers are concerned. The 999cc turbo-petrol engine still makes 125hp and 170Nm of torque. However, where the earlier car had to make do with a 5-speed manual transmission, this latest update has roped in a new 6-speed unit to do the job. Armed with an ‘S’ badge and cosmetic changes throughout, it looks like this EcoSport has arrived ready to play. What is it like on the outside? 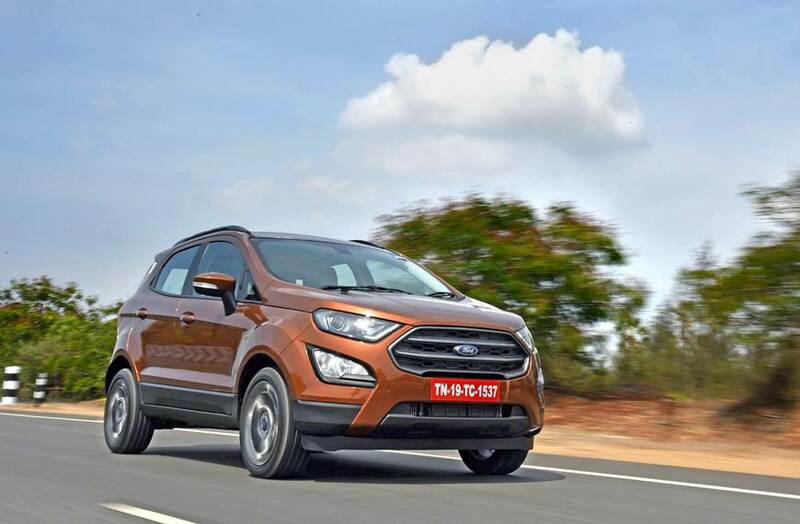 Simply put, the S is a sporty iteration of the EcoSport and like all things sporty, the EcoSport has been given a heavy dose of black. The front grille, roof and roof rails, fog lamp bezels and headlamps have traded in all chrome and faux metal bits for all-black inserts. The headlamps are now HIDs rather than the conventional halogen bulbs seen on other variants, and also seen are newly-designed smoked 17-inch alloy wheels. What is it like on the inside? Inside, it is equally sporty, with black dominating the interiors along with orange inserts on the doors and centre console; the seats get orange stitching and highlights. The instrument cluster now features chrome rings for the dials and also a new LCD MID screen, but the highlight of the interior is the all-important electric sunroof. Infotainment-wise, you get the same 8-inch touchscreen system with Apple CarPlay, Android Auto and Ford’s SYNC3 command system, but exclusive to the S is a tyre pressure monitoring system (this, like a few other features, was earlier available on the Titanium+ until it got a mild de-spec). Other aesthetic additions include alloy pedals which further add to the sporty visuals. The rest of the interior, though, remains the same as on the Titanium+ spec; in other words, it carries forward the part-leather seats, cruise control, ambient lighting and safety equipment such as six airbags, brake assist, stability control and hill hold assist as well. To start with refinement, at idle, you won’t hear much of the engine except for a slight murmur. Vibrations are well contained as well and you don’t feel the thrum on the steering or the gear lever. However, as you build up speed, the engine gets audible on the inside – the turbo blow-off is especially heard every time you life off the accelerator and this can get annoying after a while. Also, once you go past 3000rpm, the thrum intensifies and gets coarse in the last half of the rev band. That said, power delivery is linear and brisk, and Ford have managed to eliminate some of the lag that was characteristic of the earlier car. Flex your right foot and it takes off from 1600rpm but the real punch is delivered only after the 2000rpm mark, continuing all the way upto the 6600rpm redline. There are no flat spots and the pull is nice and clean. Overtaking is a rather easy affair even if you’re cruising in fourth gear and decide to make a quick move. Tractability is another highlight of this SUV as you can amble around in the city in third gear quite easily without needing to constantly shift through the cogs. Speaking of which, the clutch is firm and not as light as some of its rivals – which could be an issue in traffic – but it is fluid and progressive, and this helps reduce jerky shifts. The new six-speed transmission offers smooth shifts thanks to the gears being well-spaced. The additional gear further helps while cruising on the highways. You can set the cruise control at 100kph and sit at 2400rpm all along, if you like. The brakes are nice and sharp, too, and although the bite is strong, it is linear and there is no sign of a head-nod every time you dab them. The S version is clearly more driver-focused, which makes steering feedback and feel very important. Well, like a majority of Fords, the EcoSport works just fine, too. It has a good heft to it and in the corners it is consistent and offers decent feedback. Grip levels are impressive as well although there is a hint of understeer if you really push it into a corner. The suspension, too, is on the firmer side which translates to excellent high-speed stability but results in a bumpy ride at almost all speeds. Bumps and broken roads aren’t filtered as well as by the competition and some of this also has to do with the fact that the S version gets bigger alloy wheels with smaller profile tyres. Ford is offering the S variant on both petrol and diesel models and both are priced at a premium of Rs 85,000 over the Titanium+. In the diesel version, this difference would get you only extra features like the HID headlamps and the sunroof. However, the petrol, in addition to these, also gets you an upgrade to the EcoBoost engine and the six-speed manual gearbox. Add to that the sporty styling and the fantastic driving dynamics, and the EcoSport S makes for a cracking value proposition.